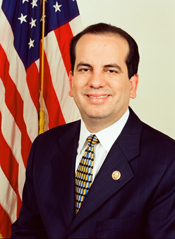 Aníbal Acevedo-Vilá was born on February 13, 1962, in Hato Rey, Puerto Rico, to state senator Salvador Acevedo and Elba Vilá. He earned a degree in political science from the Universidad de Puerto Rico in 1982 and graduated from its law school three years later. After clerking for the supreme court of Puerto Rico, he moved to the mainland United States, where he earned a master's degree from Harvard Law School in 1987. For the next two years, he clerked for the chief judge of the U.S. Court of Appeals for the First Circuit, returning to Puerto Rico in 1989. He married Luisa Gándara, and the couple had two children, Gabriela and Juan Carlos. 1Roberto Santiago, “Statehood’s Out under P.R. Leader,” 9 November 2000, Daily News: 29. 2Hearing before the Senate Committee on Energy and Natural Resources, To Consider the Results of the December 1998 Plebiscite on Puerto Rico, 106th Cong., 1st sess. (6 May 1999): 22. For more on Acevedo-Vilá’s political philosophy and his support for commonwealth status, see Congressional Record, Extension of Remarks, 107th Cong., 2nd sess. (24 July 2002): E1338–E1339. 3Aníbal Acevedo-Vilá, “Biography,” http://webarchive.loc.gov/ lcwa0005/20040125060636/http://www.house.gov/acevedo-vila/ xp/eng/biography.htm (accessed 14 February 2011). 4For Acevedo-Vilá’s testimony, see Hearing before the House Committee on Natural Resources, H.R. 856:A Bill to Provide a Process Leading to Full Self-Government for Puerto Rico, 105th Cong., 1st sess. (19 March 1997); Workshop before the Senate Committee on Energy and Natural Resources, To Provide the Committee with an Overview of the Political Status Discussion in Puerto Rico, 105th Cong., 2nd sess. (2 April 1998); Hearing before the Senate Committee on Energy and Natural Resources, H.R. 856: A Bill to Provide a Process Leading to Full Self-Government for Puerto Rico, S. 472: To Provide for Referenda in Which the Residents of Puerto Rico May Express Democratically Their Preferences Regarding the Political Status of the Territory, and for Other Purposes, 105th Cong., 2nd sess. (14, 15 July 1998). For Acevedo-Vilá’s testimony after the plebiscite, see Hearing before the Senate Committee on Energy and Natural Resources, To Consider the Results of the December 1998 Plebiscite on Puerto Rico, 106th Cong., 1st sess. (6 May 1999). 5Workshop before the Senate Committee on Energy and Natural Resources, To Provide the Committee with an Overview of the Political Status Discussion in Puerto Rico, 105th Cong., 2nd sess. (2 April 1998): 20, 22. 6Mireya Navarro, “Puerto Ricans Vote for the Status Quo,” 14 December 1998, New York Times: A1. 7Frank Ramos, “Election Campaign Is a Roller Coaster Ride,” 29 October 2000, San Juan Star: 28. 8Romero-Barceló even expressed doubts about the patriotism of Acevedo-Vilá and other PPD officials during hearings on H.R. 856 in 1997. Regarding the nature of the election, see Eva Llorens Velez, “Jabs on Vieques, Status Dominate Debate,” 30 October 2000, San Juan Star: 8. For more on the election, see “Campaign Briefs: CRB Asked to Cut Personal Attacks,” 2 October 2000, San Juan Star: 10; Marty Gerard Delfin, “Complaints on Morey, CRB Dismissed,” 5 October 2000, San Juan Star: 8; Maria Soledad Calero, “Acevedo Vilá: I Preferred to Let Complaint Run Its Course,” 6 October 2000, San Juan Star: 5; “Campaign Briefs: Rodríguez: CRB Aided by Proposed Disbarment,” 9 October 2000, San Juan Star: 8; Marty Gerard Delfin, “CRB, Acevedo Vilá File Memorandums Defending Positions,” 11 October 2000, San Juan Star: 12; Leslie Donaldson, “Attack Ads Flourish in Last Weeks of Campaigns,” 15 October 2000, San Juan Star: 5. 9Robert Friedman, “FEC: CRB Tops Acevedo in Stump Funds,” 22 October 2000, San Juan Star: 5. 10Eva Llorens Velez, “Jabs on Vieques, Status Dominate Debate,” 30 October 2000, San Juan Star: 8. 11“Campaign Briefs: Acevedo-Vilá Gets Union Backing,” 25 October 2000, San Juan Star: 15; “Campaign Briefs: Acevedo-Vilá: Less U.S. Control,” 3 October 2000, San Juan Star: 6; “Campaign Briefs: Acevedo Unveils Environment Plan,” 16 October 2000, San Juan Star: 6; “Hopefuls for D.C. Post Debate Vieques, Status,” 20 October 2000, San Juan Star: 12; “Campaign Briefs: Acevedo-Vilá Plan Is Also on Internet,” 13 October 2000, San Juan Star: 6; “Campaign Briefs: Acevedo Unveils Environment Plan,” 16 October 2000, San Juan Star: 6. 12Eva Llorens Velez, “D.C. Post Hopefuls Prepare to Vote,” 7 November 2000, San Juan Star: 6; Maria Soledad Calero and Carlos Antonio Otero, “Acevedo-Vilá Defeats Incumbent CRB for Resident Commissioner,” 8 November 2000, San Juan Star: 7; Rachel Van Dongen, “Puerto Rico’s Man on the Hill Ousted,” 13 November 2000, Roll Call. “Election Statistics, 1920 to Present,” http://history.house.gov/institution/election-statistics/electionstatistics/. 13“Local Briefs: Acevedo Chosen for Dem Caucus,” 17 November 2000, San Juan Star: 13; Aníbal Acevedo-Vilá, “Biography,” http:// webarchive.loc.gov/lcwa0005/20040125060636/http://www.house. gov/acevedo-vila/xp/eng/biography.htm (accessed 14 February 2011). For information on his larger agenda, see Jose A. Delgado, “Acevedo-Vilá Will Be Sworn In Today as Resident Commissioner,” 3 January 2001, San Juan Star: 8; “Securing Section 30A Would Be True Test for PDP’s Acevedo-Vilá,” 29 November 2000, San Juan Star: 25. 14Robert Friedman, “Acevedo’s Portrayal of P.R. as a Nation May Confuse Many in D.C.,” 8 January 2001, San Juan Star: 4. See also Robert Friedman, “Acevedo-Vilá Agrees to Cosponsor Medicaid Bill,” 4 January 2001, San Juan Star: 8. For criticism of Acevedo-Vilá’s decision, see Guillermo Moscoso, “Like It or Not, P.R. Not Free from U.S. Congress,” 17 January 2001, San Juan Star: 22; Guillermo Moscoso, “The Time Is Now For P.R. to Make Decision,” 7 February 2000, San Juan Star: 38. 15Robert Friedman, “Acevedo: Vote Shows P.R. Status Stance,” 13 November 2000, San Juan Star: 5; Robert Becker, “PDP Needs Friends in Washington, D.C.,” 13 November 2000, San Juan Star: 25; Karen Carrillo, “Viequens Reach Milestone in Bombing Struggle, Still Remain Vigilant,” 15 March 2001, New York Amsterdam News: 5; Ivan Roman, “Vieques Parties, Calls for Cleanup; On Thursday, the Navy Will Leave Its Bombing Range, But Remnants of Weapons Will Remain,” 30 April 2003, Orlando Sentinel: A1; John McPhaul, “Acevedo-Vilá Blasts Navy,” 16 January 2001, San Juan Star: 6. 17Hearing before the Senate Committee on Energy and Natural Resources, To Consider the Results of the December 1998 Plebiscite on Puerto Rico, 106th Cong., 1st sess. (6 May 1999): 22; Larry Luxner, “Calderón Invites Fox to Island; Acevedo Hopes Ties Improve,” 22 February 2001, San Juan Star: 10. 19Robert Friedman, “Push for Tax Relief May Face Hurdles,” 4 February 2001, San Juan Star: 5; Robert Friedman, “Bush Plan Unlikely to Include P.R. Tax Proposal,” 7 February 2001, San Juan Star: 9. 20Robert Friedman, “Acevedo-Vilá: 936 Phase Out Has Had Disastrous Effects,” 8 February 2001, San Juan Star: 8; John McPhaul, “Acevedo-Vilá Will Prod Congress to Give P.R. a Piece of the Tax-Cut Pie,” 10 February 2001, San Juan Star: 4; Congressional Record, House, 107th Cong., 1st sess. (13 March 2001): H834–H835. 21Aníbal Acevedo-Vilá, “Sunny Economic Returns; Tax Revision Would Revitalize Puerto Rico and America,” 10 October 2002, Washington Times: A21. 22John Marino, “Puerto Rico’s New War on Poverty; Critics Fault $1 Billion Proposal as Paternalistic and No Substitute for Statehood,” 4 September 2002, Washington Post: A3. 23For veterans’ benefits, see Congressional Record, House, 108th Cong., 1st sess. (21 November 2003): H12156. For the workforce bill, see Congressional Record, House, 108th Cong., 1st sess. (8 May 2003): H3787. For Medicare, see Congressional Record, House, 108th Cong., 1st sess. (5 June 2003): H5039. 24Quotations from Congressional Record, House, 107th Cong., 2nd sess. (7 May 2002): H2125–2127. For the committee report, see House Committee on Resources, Caribbean National Forest Wild and Scenic Rivers Act of 2002, 107th Cong., 2nd sess. H. Rep. 107-441. For the final law, see Caribbean National Forest Wild and Scenic Rivers Act of 2002, P.L. 107-365, 116 Stat. 3027–3029. 25Chris Wright, “Puerto Rico’s Delegate Won’t Run Again,” 4 June 2003, Roll Call; “Puerto Rican Delegate in D.C. Will Run for Seat in Territory,” 10 June 2003, Orlando Sentinel: A11; “Puerto Rico; Resident Commissioner Will Run for Governor,” 21 July 2003, Roll Call. 26On the gubernatorial election, see Abby Goodnough, “Puerto Rico’s Election Has Extra Dose of Drama,” 25 July 2004, New York Times: 12; Nancy San Martin, “Close Governor’s Race Requires a Recount,” 4 November 2004, Miami Herald: A9; Abby Goodnough, “Governor’s Race Keeps Puerto Rico in Suspense,” 17 November 2004, New York Times: 16; “Commonwealth Backer Wins in Puerto Rico,” 24 December 2004, Pittsburgh Post-Gazette: A6; Abby Goodnough, “Officials Call Disputed Race for Governor of Puerto Rico,” 29 December 2004, New York Times: A16; Almanac of American Politics, 2008 (Washington, D.C.: National Journal Group Inc., 2007): 1806. 27Matthew Hay Brown, “New Puerto Rico Governor Faces Challenges,” 2 January 2005, Orlando Sentinel: A13; Ray Quintanilla, “Governor, Lawmakers Must End Stalemate,” 17 April 2005, Orlando Sentinel: A11; Pablo Bachelet, “Party Sets in Motion a Push for Statehood,” 7 February 2006, Miami Herald: A10; Anibal Acevedo-Vilá, “When Puerto Ricans Vote, They Choose Commonwealth,” 19 March 2006, Miami Herald: L1; Frances Robles, “Lawyer Hopes to Beat Odds to Win Statehood,” 3 April 2006, Miami Herald: A10; Frances Robles, “Lawmakers Try to Avert Government Shutdown,” 28 April 2006, Miami Herald: A10; Frances Robles, “Thousands Are Idled; No Solution Seen,” 2 May 2006, Miami Herald: A1; Rick Lyman, “Compromise Resolves the Fiscal Crisis in Puerto Rico,” 9 May 2006, New York Times: A18. 28As quoted in Damien Cave and Omaya Sosa-Pascual, “Puerto Rico Ex-Governor Acquitted of Graft,” 21 March 2009, New York Times: A13. See also Kirk Semple, “Puerto Rico’s Political Melodrama Plays On, with Its Governor in the Lead Role,” 24 February 2008, New York Times: A24; Carrie Johnson and Matthew Mosk, “Puerto Rico’s Governor Is Charged with Corruption,” 28 March 2008, Washington Post: A1; Frances Robles, “Puerto Rico’s Governor Is Indicted on New Charges,” 20 August 2008, Miami Herald: A13; Jeannette Rivera-Lyles, “Puerto Rico’s Governor: Latest Charges Are Bogus, Too,” 21 August 2008, Orlando Sentinel: D3; Susan Anasagasti Akus and Frances Robles, “Indicted Governor Faces Tough Challenge,” 3 November 2008, Miami Herald: A16. Acevedo-Vilá, Aníbal. En honor a la verdad. San Juan, Puerto Rico: Coridillera, 2000. "Aníbal Acevedo-Vilá" in Hispanic Americans in Congress, 1822-2012. Prepared under the direction of the Committee on House Administration by the Office of the Historian and the Office of the Clerk, U.S. House of Representatives. Washington: Government Printing Office, 2013.